Cupcake Inspirations Challenges are celebrating their 400th blog challenge, and STAMPlorations is helping them to celebrate today by being a sponsor. So the challenge is to use a previous challenge as your inspiration. 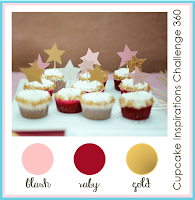 I went for blush, ruby and gold from challenge 360. The blush was Spun Sugar, the ruby was a mix of Candied Apple and Aged Mahogany, and the gold was some writing ink that I got from the Museum of London, watered down and splattered. I used stamps from The Bee's Knees Party Dresses and City Girl, and added a little ribbon rose on the shoulder for a bit of glam. 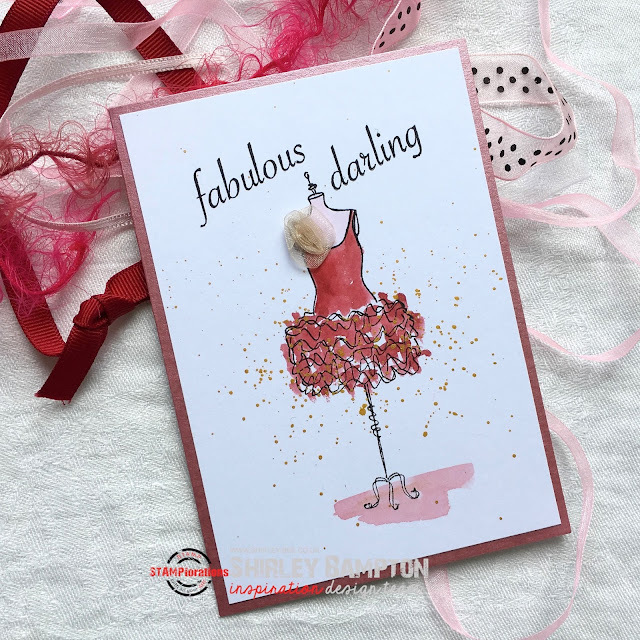 Pop on over to the STAMPlorations blog for some more fabulous inspiration from the design team, and to the Cupcake Inspirations blog to join the party. this is simply elegant, Shirley. love that ribbon rose you added -- the dress itself is already fab, but it became even more fab with that rose! so pretty....I always enjoy my visits here!